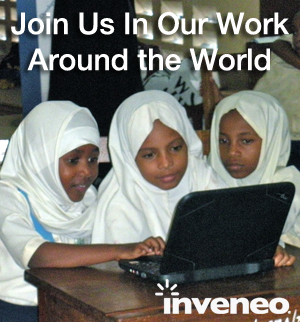 Inveneo has a strong ecosystem of 120+ partners designing, implementing, and supporting information and communications technology (ICT) projects in more than 20 countries. Partnerships are formed through innovative certification and training programs that empower local ICT entrepreneurs with increased visibility, knowledge sharing, resource acquisition, and high-value job creation. Inveneo Certified ICT Partners (ICIP)s are established companies that have a track record of ICT innovation, delivery & maintenance within the communities they serve. Inveneo Trained Startup Entrepreneurs (ITSE)s are high-potential, promising entrepreneurs that start their own ICT businesses to become financially self-sufficient. ICIPs & ITSEs are scaling the impact of Inveneo by expanding their business activity into rural and underserved areas, building capacity and increasing revenues at the same time. By using Inveneo partners, client organizations serving rural and remote communities benefit from decreased total cost of installation, improved ICT support, and reduced risk of project failure. Contracting an Inveneo local partner to design and install ICT solutions decreases total cost of system installation and support by as much as 80 percent and overall project costs by as much as 60 percent, through a combination of lower local-labor fees and reduced international travel cost of Inveneo staff. Inveneo partners offer local ICT installation and maintenance services supported by Inveneo’s cutting edge research and development into appropriate ICT systems. This local support improves service response times and overall service level, advancing organizational efficiency and program delivery. Finally, hiring Inveneo partners reduces overall project risk for clients because ICIPs and ITSEs have been schooled in our innovative certification and training programs. This gives clients the confidence in our local ICT professionals that they will get the job done, not only correctly but using the best possible ICT solutions available. Connect with Inveneo to enjoy the Inveneo Partner Program ecosystem and the support it can provide to your development activities.